A few weeks ago 'Weird Al' Yankovic teased fans with a shot from the recording booth, promising new music was on the way. He then made the surprise announcement earlier this week that a new single was about to drop. And now here it is. 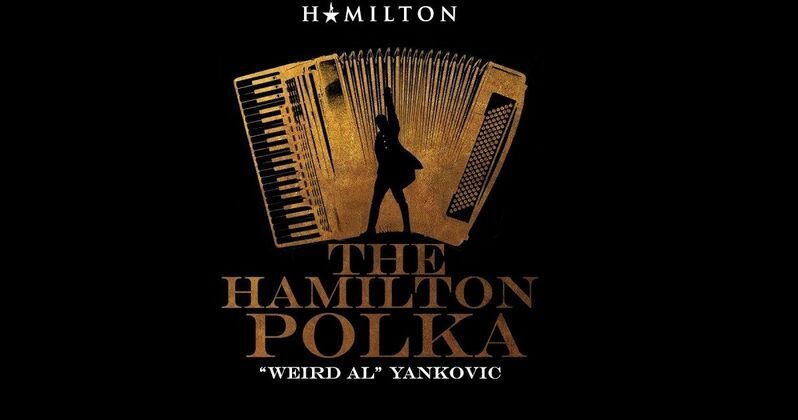 The Hamilton Polka. Most Weird Al fans were quite suave and picked up right away that Yankovic was planning something with Lin-Manuel Miranda. Especially since the surprise release was arriving on Hamiltondrop Friday. And Al didn't disappoint. Well, there were a few sad faces who don't know anything about Hamilton and thought they were getting a Cardi B parody of Bodak Yellow that would have found the king of all parody singing about 'orTHOpeDIC SHOES!' Perhaps that will be saved for a later date. Lin-Manuel Miranda and Weird Al are longtime mutual fans of each other's work, and have become fast friends over the years. Miranda has made it no secret that he was a Weird Al nerd growing up, and was weened on his music as a young Child. Yankovic has been sighted numerous times as a huge influence in helping creating the play Hamilton. Weird Al is a big fan of Hamilton and jumped at the chance to bring this medley to life, which takes all the best songs from the play and mashes them together into one five minute epic of a traditional Polka that you'll be listing to for days on end, especially if you're already a fan of the play. An interesting bit of trivia about the two friends, they both received news of their stars on the Hollywood Walk of Fame at the same time, and were with each other when the duel announcement was made. This isn't the first time the pair have worked together, though. Back in 2016, Lin-Manuel Miranda joined Weird Al on staged to help sing Al's hit Star Wars parody of The Kinks' Lola called Yoda. Now, Al has returned the favor. And as luck would have it for all you Weirdos out there, both Miranda and Yankovic will be appearing on The Tonight Show later this evening to show off their stuff. Weird Al is known for putting on quite a good show. You don't have to wait long to get your hot little hands on The Hamilton Polka. The Official Hamilton Polka Youtube has released the single for all to hear. And if that wasn't enough for you, we also have that classic moment when Miranda joined Yankovic on stage to belt out lyrics about how Luke uses the force, lifted some rocks, and stood on his head. You can check it all out below. Then don't forget to check out the pair when they debut the song later tonight on Jimmy Fallon. It's going to be a moment you don't want to miss. Seriously. This is bigger than the Oscars!